The right Halloween decor can make or break your whole holiday, and Instructables user TheNewHobbyist has created the pitch perfect Halloween display. 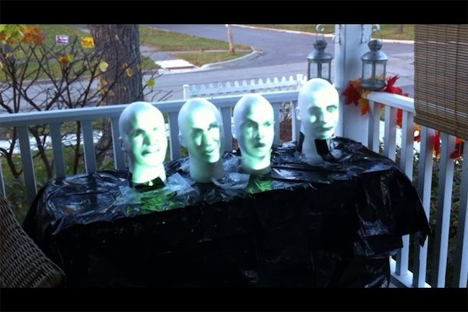 Using styrofoam heads, and Arduino UNO, a karaoke machine, projector, and a few other bits and bobs, the creative tinkerer built a quartet of singing busts for the Halloween porch. TheNewHobbyist modeled the project after the crowd-pleasing Haunted Mansion ride at Disneyland/Disneyworld. The display consists of four heads that sit on a table and sing a spooky song when the display is tripped by an industrial photocell switch. The projected images came from a YouTube video of four singing heads that, when projected to line up perfectly with the styrofoam heads, seem to create life-like decapitated minstrels. In the Instructables explanation, TheNewHobbyist explains that having a mechanical engineer as a father was a big help in creating the creepy display. The effect is surprisingly realistic; the projected faces and recorded music really make the faces look like they’re singing and are sure to freak out all of the unsuspecting trick-or-treaters who come by looking for candy. Hop on over to Instructables for the technical specs and instructions to make your very own haunted Halloween display.